Tideflex Technologies’ developed a special series of Tideflex Duckbill Check Valves called Tideflex Diffuser Valves (TFD). 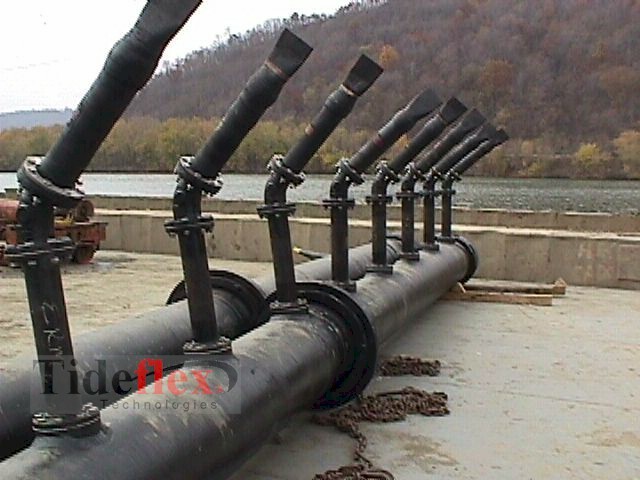 TFD’s differ from standard Tideflex because TFD’s are custom-designed for every outfall based on jet velocity, open area and headloss requirements that are critical to achieving the required initial dilution within the hydraulic head limitations of the outfall. There are up to 50 different hydraulic variations of TFD’s per nominal size. An extensive amount of independent hydraulic testing was required on many sizes and stiffness of TFD’s to develop the hydraulic models Tideflex engineers use to assist in the design of multiport effluent diffusers. TFD’s have been extensively utilized on inland and marine multiport effluent outfall diffusers for over 20 years – municipal and industrial applications including chemical, pulp and paper, power (thermal-heat dissipation), textile (dilution of color), lumber, agricultural, food, pharmaceutical, plastics, metals and fertilizer. Multiport effluent diffusers were conventionally designed with fixed diameter open ports but open ports allow backflow of sand, silt, debris and salt water which reduces the hydraulic capacity of the outfall and compromises the initial dilution. The cost to clean out the outfall and restore to service is excessive and the potential for future cleanout still exists as the marine environment cannot be controlled. TFD’s prevent the backflow of sand, silt, debris and salt water into the outfall thereby preserving the hydraulic capacity and dilution efficiency of multiport effluent diffusers. TFD’s also have a hydraulic advantage due to the inherent variable orifice characteristic– the TFD’s progressively open/close with increase/decrease in flow. The benefit, compared to fixed diameter ports, is higher jet velocity at lower flows and less headloss at peak flow. The optimized jet velocity yields improved near-field mixing and dilution and the reduced headloss increases the hydraulic capacity of the outfall. TFD’s have also proven to produce a more uniform flow distribution among ports. TFD’s are installed on new outfall diffusers and are easily retrofit to existing outfalls. Red Valve engineers run hydraulic models to optimize the quantity, size, and relative stiffness of the TFD’s to meeting the hydraulic and dilution requirements of the diffuser. The data supplied can be directly input to environmental impact assessment models such as CORMIX and Visual Plumes.